Course Description: In this age of information, data needs to be shared between PLC equipment. 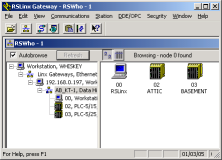 This communication can take place over a variety of different networks such as Devicenet, Controlnet, Ethernet, or Data Highway Plus. In this course, we will look at the communication methods your plant is using to show the students how PLCs interact with each other using your own plant programs as an example. This knowledge is very useful when an interruption of data flow occurs causing downtime, or when additional data needs to be transferred between pieces of equipment. Prerequisites: Students who take this course should be comfortable working in a windows-based environment, and working with PLC ladder logic. Copyright © 2007 Automation Training, Inc. All Rights Reserved.